This is a portion of the Oamaru walkway track. 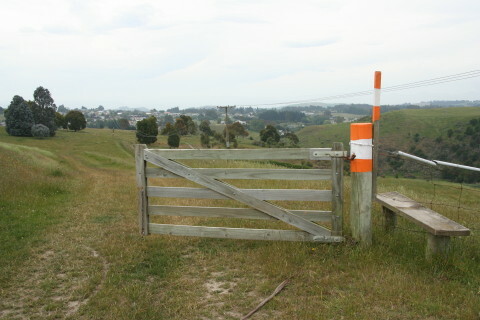 It is one portion that is actually open, though dogs are not welcome during lambing season. The track begins on the west side of Eden St (the Skyline walkway on the eastern side of the street which would go through to Derwent St is closed until further notice). Part of this track are being upgraded, particularly near Old Mill Road and there are additional entry/exit points on this western portion of the track. Eden Street goes uphill, and the Skyline walkway continues this and thus gives views down to Oamaru harbour and city centre. The track descends steeply to Chelmer St beside the gardens and play area. The official Oamaru walking track signs say 30 minutes for the walk one way. Either from Chelmer St opposite the gardens, or from Eden St about 1.5 km from the centre of Oamaru.